Whether eaten as a tasty meal or taken in supplement form, salmon oil offers numerous health benefits. Salmon oil and other types of fish oil are loaded with omega-3 fatty acids and nutrients that support key functions in the body. To experience the benefits of salmon nutrition and give your health a boost, try including salmon in your diet two or three times per week. Fish oils such as salmon oil contain the omega-3 fatty acids known as docosahexaenoic acid (DHA) and eicosapentaenoic acid (EPA). These omega-3s are considered “essential” fatty acids, meaning that it's necessary to get them from food because the body can't make them. Salmon is an especially excellent source of DHA and EPA. One 3.5-ounce portion of farm-raised salmon has 2.3 grams of long-chain omega-3 fatty acids, with the same portion of wild salmon containing slightly more at 2.6 grams. To experience fish oil benefits, you can eat not only salmon, but also mackerel, albacore tuna and other fatty fish. These fatty acids may contribute to brain function and normal growth and development as well as protect against inflammation. Conversely, a deficiency of omega-3s could lead to cardiovascular disease, some cancers, mood disorders, arthritis and other health issues, according to Harvard Health Publishing. Harvard Health also notes a possible benefit of consuming fish oil from food sources rather than from supplements alone. The evidence doesn't definitively link the use of supplements to the protective benefits of fish oil described above. In short, it may be wise to eat a range of foods containing omega-3s and not solely rely on supplements. That means consuming fatty acids not only from fish, but also from plant-based sources, and using supplements as secondary support. Eat a wide range of foods containing omega-3s, including not only salmon oil, but also plant-based sources such as walnuts and flaxseeds. You don’t have to eat fish to experience the benefits of omega-3s. Try adding plant-based sources of omega-3s to your diet, such as flaxseeds, walnuts and pumpkin seeds. These foods are rich in the omega-3 known as alpha-linolenic acid, which the body converts to DHA and EPA. Salmon oil supplements are yet another option for those who avoid fish consumption. 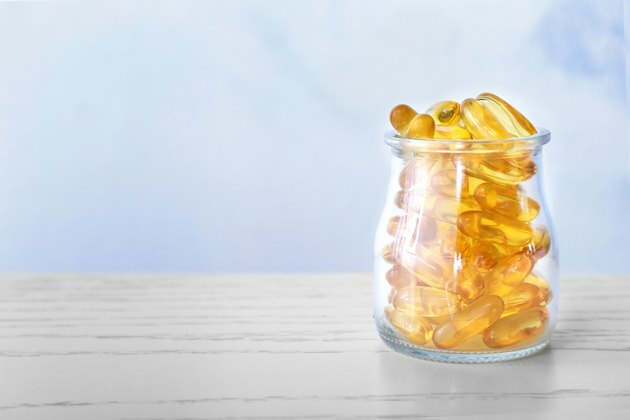 If you choose to take fish oil capsules or liquid fish oil, look for a supplement that includes 700 to 1,000 milligrams of EPA and 200 to 500 of DHA daily. Historically, omega-3s were a dietary staple when eating fish was more the norm than the exception. However, the modern diet is often flooded with omega-6s from refined vegetable oils used in fried and snack foods. As a result, many people have too many omega-6s in the blood and not enough omega-3s. With too many omega-6s in the blood, there can be an increased risk of heart disease. Salmon consumption may help increase omega-3s in the blood, balancing the ratio of omega-3s and omega-6s. One study found found that eating farmed salmon twice per week boosted omega-3s in the blood to levels associated with a lower risk of cardiovascular disease. If you choose to use fish oil supplements, note that quality matters. Products derived from molecularly distilled fish oils are high in EPA and DHA and likely to be low in contaminants. Ideally, the product should have undergone third-party testing to ensure that it's free of heavy metals and environmental toxins. Take special care to consume a quality fish oil if you're pregnant or breastfeeding. Omega-3s contribute not only to the health of the mother, but also to the brain and nervous system development of the fetus or newborn. A word of caution: Larger fish, such as salmon, tuna and swordfish, may contain high levels of mercury, which can be harmful for developing brains. Opt for fish species that are low on the food chain and likely to be low in contaminants, such as sardines, if you're pregnant or nursing. As with a developing fetus, children can benefit from consuming quality fish oil two to three times per week. In addition to boosting brain health in the developing brain, salmon nutrition may help prevent ADHD symptoms. With regular salmon consumption, children may be able to focus better at school and remember material more easily. If your child turns up his nose at eating cold-water, oily fish, such as salmon, aim to supplement with 1 gram of fish oil daily in the form of a supplement or liquid. Ask your child’s doctor to recommend the exact dosage. Read more: How Much Omega-3 Should Children Get in a Day? Salmon is rich in protein, containing 22 to 25 grams per 3.5-ounce serving, making it an ideal protein source in your diet. Like omega-3s, protein is another “essential” nutrient that you need to get from your diet. A diet that includes 20 to 30 grams of protein per meal helps the body maintain muscle mass and bone health and recover from injury. Because it's high in protein, salmon can help promote a feeling of satiety, so you’re less likely to overeat. Protein-rich foods may also help increase your metabolic rate. Salmon and other proteins are particularly effective at reducing belly fat. So, if you're trying to lose weight, eating salmon and other high-quality proteins is one of the best ways to drop the weight and keep it off. Fatty fish such as salmon are high in the fat-soluble vitamin D, a hormone that the body produces when exposed to sunlight. Once converted to a usable form in the body, vitamin D promotes bone health, immune function and even cancer protection. It’s possible to become deficient in vitamin D if you don’t spend a lot of time in the sun. So, it’s important to consume foods high in the vitamin or take a supplement to prevent any deficiencies. Salmon contains numerous vitamins and minerals that support important bodily processes. For example, salmon is high in potassium, which helps control blood pressure and reduces stroke risk. Salmon is also rich in selenium, which may help protect bone health, reduce cancer risk and improve thyroid function for individuals with autoimmune thyroid disease. Finally, salmon is loaded with B vitamins that ensure optimal functioning of the brain and nervous system, reduce inflammation and convert food into energy for the body. The familiar red pigment of salmon comes from astaxanthin, an antioxidant that may provide several protective benefits. Notably, salmon consumption is linked with the preservation of mental health. Working in combination with salmon’s omega-3s, astaxanthin staves off inflammation of the brain and nervous system, slowing cognitive decline. Salmon oil offers anti-inflammatory benefits in other areas of the body too. There may be a link between salmon oil consumption and reduced risk of heart disease, diabetes, cancer and other chronic diseases. People who eat fish tend to have lower rates of heart disease. In a study of Greenlandic Inuit people, for example, there was a low death rate from coronary heart disease, attributed to their high fish consumption. Fish oil can boost levels of “good” HDL cholesterol, lower triglycerides, reduce blood pressure and prevent the formation of artery-clogging plaque. Fish oil may even reduce fatal arrhythmia events (abnormal heart rhythms) that can lead to heart attacks. Including omega-3 fatty acids, such as salmon and fish oil, in your diet has external benefits too. Whether you have thinning hair, dandruff, eczema or other skin issues, eating salmon and other sources of omega-3s can help heal your skin and provide relief. If the problems persist or if you’re unsure about what type of condition you may have, check with your dermatologist to be sure you don’t have an infection or other issue affecting your skin. The omega-3s in salmon also are associated with glowing skin. The same astaxanthin that provides antioxidant benefits also reduces free radical damage, a key contributor to skin aging. With a few servings of salmon in your weekly diet, you can keep skin looking youthful and supple. One of the simplest anti-aging tricks is eating more salmon oil. Make it a part of your "beauty" routine with regular consumption. When choosing between wild-caught versus farm-raised salmon, there are a few factors that may influence your decision. Farm-raised fish may contain more pollutants and cancer-causing chemicals than wild salmon. At the same time, both types have the potential to contain harmful contaminants. In addition, there can be a concern about antibiotic use in farm-raised fish, whereas wild fish don't pose such a risk. To mitigate risk, it’s best to limit fish consumption — either wild caught or farm-raised — to two or three times per week. You can then turn to plant-based sources of omega-3s or supplements to increase your intake. Baked, poached, grilled, steamed or raw — salmon is a versatile fish that’s easy to incorporate in a variety of dishes. Grill it and slice it into a salad or serve it over steamed vegetables. Make your own sushi or chop it up in a poke bowl. Even for those averse to fish, salmon may be an appealing option. Unlike mackerel and sardines, salmon has a less “fishy” taste than many other types of fatty fish. Two to three times per week, replace your usual chicken or beef protein source with salmon to experience salmon nutrition benefits. Fish oil supplements may affect blood clotting. As such, be cautious about consuming fish oil if you’re taking anticoagulant drugs such as warfarin, if you've had a stroke or if you're preparing for surgery. In addition, those with fish allergies should avoid fish oil and instead opt for alternate sources of omega-3 fatty acids. Harvard Health Publishing: Fish Oil: Friend or Foe?